OL4 – The English Lakes, North Western Area. 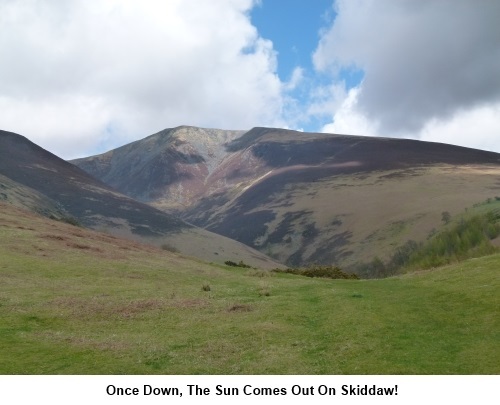 Introduction: A Skiddaw walk is a popular excursion in the Lake District as for the thousands of walkers who stay in Keswick, as it is almost the first mountain you see as you step out of the door. It towers above the town. It is also popular because it is one of the few mountains in England over 3,000 feet high, at 3054 ft. (931m) and therefore on many mountaineers’ “must do” lists. A consequence of its popularity is that you are bound to have company on the way but they will be fellow walkers, so decent folk! A plus is that the routes are so well trodden that it is almost impossible to get lost, even in poor visibility. 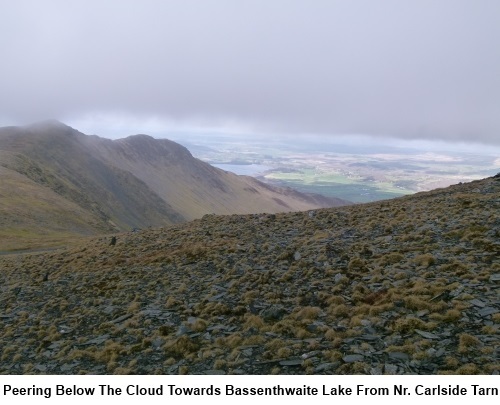 I say “almost” because the route I describe off the summit can be a little tricky to spot if the cloud descends – a not infrequent occurrence over 3000 feet! More about this below. If in doubt, you can always come back the same way but I prefer circular routes. It is a hard walk, very steep ascent almost from the word go and an equally steep descent which can be hard on the knees. There is no scrambling however. 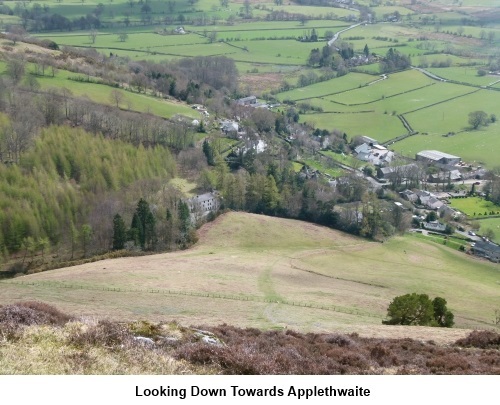 The last section is a 1.8 mile walk along the lane behind Applethwaite but do not let that put you off as the views along here, across to the Derwent Fells, are truly fine. The best places for a picnic are probably the shelters close to the summit or on the descent as you get close to Carlside Tarn. 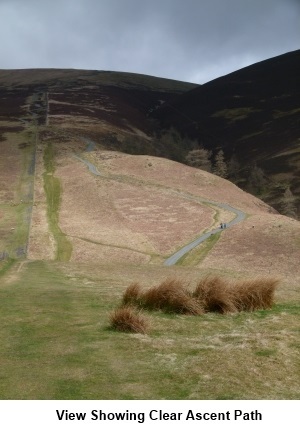 There are various routes up Skiddaw but this one starts at the Ormathwaite car park. To get there, turn north east off the A591 just north of the roundabout which joins with the A66, to the north of Keswick. There is a turn signposted to Ormathwaite and Underscar immediately after the roundabout but you would have to be really on the ball to spot it in time (and so would anyone behind you!). 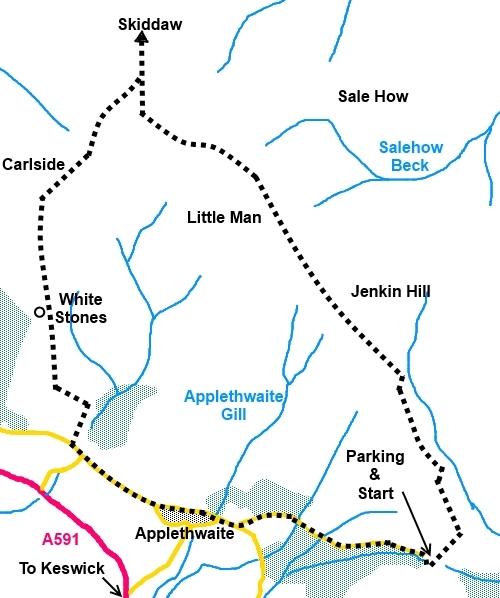 Better to spot this as you pass then take the next turn, less than half a mile further on signposted for Applethwaite. Follow this into the hamlet and turn right at the ‘T’ junction. Turn left at the junction bearing the road sign “Skiddaw via public footpath”. This road is somewhat “potholey” but passable with care by ordinary cars. Follow the road to its end, ignoring the first car park by some trees. It culminates in a free, unsurfaced car park. The convention seems to be to park at one side, at right angles to the approach. Start: The path starts at the end of the car park (NY 281253), indicated by a fingerpost for Public Bridleway, Skiddaw, Bassenthwaite and Mosedale. You can see the wide clear path wending its way up the hill. It begins fairly level and you pass a memorial to two shepherds, Edward and Joseph Hawell. Very soon, after going through a walkers’ gate, it splits and you want the steeply climbing left hand path (NY 283256). There is now a hard uphill walk for a while. Just after it levels out slightly, come to a fork in the path. 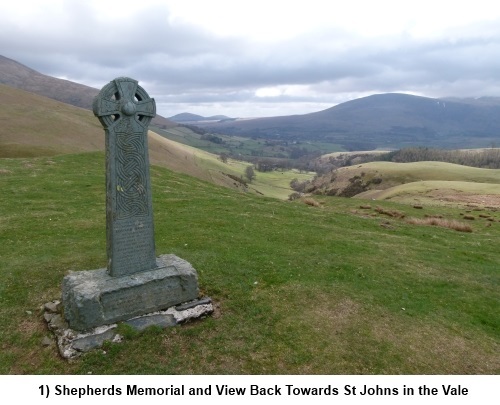 Take the right hand path through a walkers’ gate which is signposted for Skiddaw (NY 272275). Follow the obvious path to the summit., the path climbs steadily. There are a number of cairns. It then starts to descend and, if you happen to get caught in low cloud (as I did), first reaction might be that you have overshot the summit. However, you will not have passed the trig. point and in fact the path then starts to rise again to it. 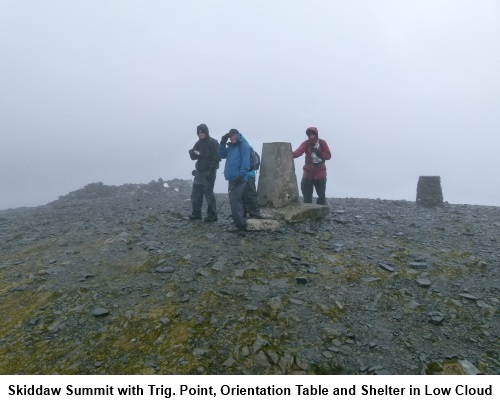 When you actually arrive at the summit, there is a rough low circular stone shelter, orientation table and the trig point itself (NY 260291). Return from the summit, initially the same way. The route down is difficult to spot amongst the shale, especially in poor visibility. The OS map shows several tracks but I mention what I think are the clearest two as follows. Retrace your steps from the trig. point due south for about 300 yards and at the sixth cairn (more like a semi circular shelter) look out for the path on the right at NY 261288. More cairns mark the route down. If you miss this, there is another which connects with it, leaving the top at NY 260286. This is at the next cairn after a (poor) shelter circle, just beyond the rise after the slight downhill from the summit. 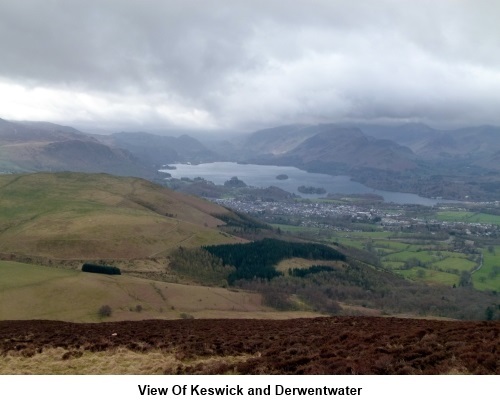 Descend to the col, where there are good views to Keswick and Derwent Water to the left and Bassentwaite Lake to the right. Incidentally, worth noting as an occasional pub quiz answer, Bassenthwaite Lake is the only “lake” in the Lake District. 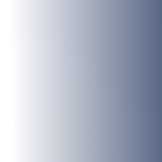 All the others are “waters”, “meres”, or “tarns”! At Carlside Tarn, the path forks (NY 256282). Go left gently climbing over Carlside (hill). The path is easy to follow. At some white rocks, fork left (NY 254272). The path eventually becomes a grassy path and joins another. Go right here and follow it down to the road. Turn left at the road. Stay on the road passing the white painted wayside chapel and go left at the “Skiddaw via public footpath” road sign you saw on the drive up, to get back to the car.